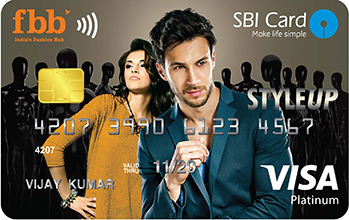 Fbb SBI Styleup Contactless Card is a credit card issued by the State Bank Of India in partnership with Fbb. With the SBI Styleup Contactless card you enjoy a flat 10% upfront discount on all your fashion apparels, accessories & footwear purchases at Fbb and Big Bazaar outlets. Note that this discount is valid over and above the existing offers or promos running in the store. Moreover there is no monthly or annual cap on the discount. 1. Welcome gift – a Rs 500 Fbb gift voucher. Wave to Pay Feature: With the Styleup Contactless Card supports ‘wave to pay’ feature. All you need to do is to wave your card at a secured reader and your transaction would be complete. The charges on the card include a one-time joining fee of Rs. 499 and a recurring renewal fee of Rs 499 per year. 1. Extended interest free credit period of 25-50 days applicable on retail purchases. 2, Finance charges upto 3.35% per month – accounting to 40.2% per annum, from the date of transaction. Impressions: Its a great card to have if you plan to do a lot of purchases from Fbb stores. With this credit card, you get an upfront 10% discount on your Fbb purchases plus a 2.5% value back on transactions at Fbb stores [in terms of reward points]. Add to that the welcome Fbb gift voucher worth Rs. 500 and yearly credit of 200 bonus reward points and you have a complete package.